Liberal Democrat-run Three Rivers District Council began to draw up a secret list of sites for new homes last year to meet the Conservative government’s housing targets. The locations under consideration have only now been made public, sparking outrage. The move is part of a public consultation to develop a new Local Plan to decide where the 600 homes Three Rivers needs to accommodate every year for the next 15 years should go. South Oxhey is once again in the firing line. 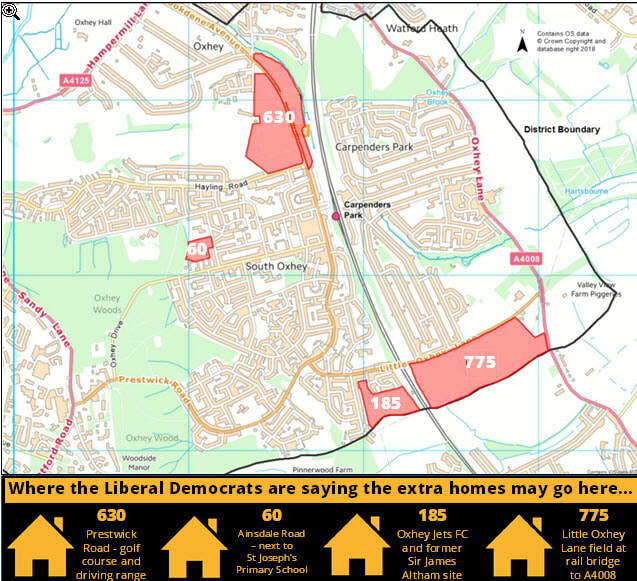 In the last Local Plan, despite Labour opposition, the Liberal Democrats voted to sacrifice open space behind homes in Heysham Drive to the bulldozer. This time it could be even worse! “The map shows the sites under consideration here. Your local Labour councillors will be seeking to get them ruled out,” said Councillor Chris Green, of Redwood Close. The Oxhey Jets Football Club stadium on the former Sir James Altham site is on one of the parcels of land earmarked, even though the club has a lease from the council until 2025. The Liberal Democrats’ consultation document says the former Golf Course and Driving Range in Prestwick Road could have 630 homes sprawling all over it. Such a move would eliminate the green space separating the estate from Oxhey Hall and result in a horrible urban sprawl. Sacrificing land next to St Joseph’s School in Ainsdale Road for development within a decade has come to the fore again with the site having previously been considered. Land in Oxhey Hall is not safe either and is being eyed-up. A large area to the north of Oxhey Hall farm running the length of Hampermill Lane from Oaklands Avenue to just beyond Brookdene Avenue. That could accommodate 415 homes it is suggested. If you want to help protect South Oxhey and Oxhey Hall from over-development, then you can register your objection to the Liberal Democrats’ local plan sites at https://www.threerivers.gov.uk/egcl-page/new-local-plan and don’t forget to let your Labour team have a copy using the form below. The consultation runs until 21 December. “These sites are not acceptable to local people and we have constantly warned the Liberal Democrats of the outcry and anger there would be,” said Councillor Stephen Cox. 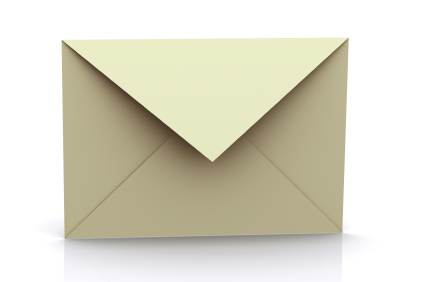 Our newsletters have consistently reported fears that you can’t trust the Lib Dems with South Oxhey’s open spaces. Labour loves South Oxhey and we always stick up for you. We’re the only ones that represent the whole estate and put your interests first each and every time. 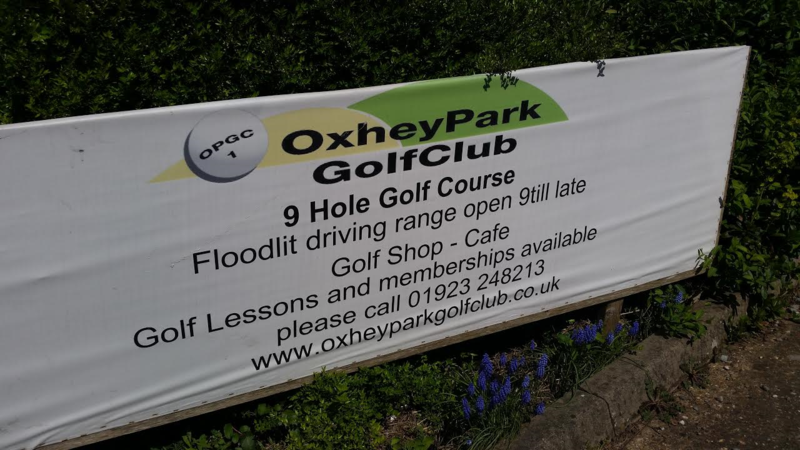 The Liberal Democrats told residents in an election leaflet as recently as October last year that the council had “no plans” to build on the golf course! Now we learn that the council-owned land could be up for grabs. The first of 514 new homes as part of the South Oxhey Initiative are now ready to move into . Eight three-bedroom houses on the site of the former Jet pub in Hayling Road will be finished and ready for occupancy by then. They are priced at £490,000 and Countryside Properties have told your Labour team that 50% are already sold. As things stand, 96 homes will be for rent. Just 48 of those will be at the lowest rents possible in perpetuity. Another 48 will start at low rents which will rise slightly after the first tenancy comes to an end. Thrive tenants above the shops in the precinct and Pennard and Luffenham Houses are eligible to move a new rented home at either Hallowes Crescent, Maylands Road, or the site of former Bridlington Road car park. ​Tenants above the shops on the North (Nisa) side of the precinct are choosing colour schemes and finishes for the move, which is expected to be in early 2018. New landlords are Home Group. Your Labour team takes a keen interest in the major project, inspecting the work, dealing with any issues that arise and serving on the Community Board which is overseeing the development as you can see from the photographs. “It is unfortunate that the Liberal Democrats who run Three Rivers council have still not committed to replacing the 96 homes at the lowest social rents in perpetuity that they originally promised. They are instead putting out wholly misleading leaflets. The facts are undisputable. They have only managed to replace half of those homes they other 48 will be at the lowest social rent for the first tenancy only. However, they spin it they are not replacing like for like," said Councillor Stephen Cox. Demolition of the shops in Station Approach is almost complete ahead of rebuilding work there incorporating new shop units and the garage will move to a new site in Oxhey Drive. ​Twenty people from the local area are employed on the scheme. That number will grow as work continues until 2022. Outline planning permission for 49 new homes on a field behind Heysham Drive was granted at a stormy meeting of Three Rivers Council’s planning committee on Thursday 25 January. The land is owned by Tory-run Herts County Council. Labour councillors backed local residents who had been opposed to removing the land from the Green Belt and thereby freeing it up for development. However the six Liberal Democrats took no notice and controversially put the plans through with four votes, including that of local Labour councillor Stephen King . At the same meeting the ruling Liberal Democrats fully backed another controversial application from the council itself for six flats on the present Bowring Green garage sites. “I voted against this too as it has gone down badly with local residents,” explained Councillor Stephen King. Labour described the council’s plans, which had been heavily amended after residents’ and councillors’ complaints as “overdevelopment”. They were narrowly passed by six votes to five. A third controversial planning application for homes on former garages in Ashridge Drive was originally withdrawn but has been resubmitted in amended form. South Oxhey's roads are in a right old state and riddled with potholes. A lethal combination of winter weather and Conservative cuts has seen dangerous potholes open up everywhere. In the last four years alone, Conservative-run Herts County Council has slashed the roads budget by some £9 million. "They have cut roads maintenance and therefore it is no surprise really that this had a detrimental effect on the condition of the carriageway. Drivers and cyclists are facing pothole peril here, there and everywhere, right across the estate," said Councillor Joan King. Your local Labour team are on regular 'pothole patrol' - getting them reported and sorted. Councillor Joan King has hit out at the Tory-run council and their contractors who will only fill the pothole reported even if there is another one opened up next to it. "Their reporting system needs an overhaul. It is daft for contractors to only fill a hole that was reported three weeks before hand as happened to me, and I then watched as they drove off not having touched one that had appeared just across the road between the first one they filled being reported and when they got round to repairing it," said an exasperated Joan. She has called on Herts County Council to "sort it out" and attacked the inefficient authority for refusing to fill some potholes at all saying; "they clearly haven't heard that a stitch in time saves nine". South Oxhey is set to get a brand new swimming pool as part of a £9 million revamp of The Centre in Gosforth Lane. A planning application, following a feasibility study undertaken in 2013, has now been submitted to Three Rivers Council for a single and two storey extension to the existing leisure centre with a new car park and vehicle access. The nearby amenity green will be turned into a new car park covered by CCTV and screened from nearby houses by trees. Work for which planning permission is not required is already underway. In addition to the new 25 metre four-lane swimming pool there will be a learner pool and wetside changing facilities. A café with viewing onto the pools is on the cards. The reception area will relocate and be near a multi-use room housing the kiln. The sports halls will be redecorated and get new flooring. The Youth Zone stays put. On the first floor there will be two studios, new changing facilities and an extended gym which will stay fully open during the expected 65-week build time. “South Oxhey’s Labour team fully supports this investment,” said Councillor Stephen Cox. The existing Sir James Altham pool facility will stay open until the new pools are completed, which is expected to be in June 2020, if planning permission is granted next month. Councillors Stephen Cox and Stephen King visit the gym! Developers Countryside PLC have been told the rents they want to charge local shopkeepers are far too high. A Labour motion criticising “exorbitant” planned rent rises, forcing shopkeepers to cough up a year’s rent in advance to get new premises in the new development and calling for the loyalty shown by existing local traders to the community to be returned was passed on the casting vote of the Chairman. Amazingly, both Liberal Democrat councillors Andrew Scarth and Alison Scarth, who represent the northern end of the estate along with Oxhey Hall, voted against Labour’s calls for fair rents and residents’ wishes. Right across South Oxhey and Oxhey Hall it seems nowhere is safe from having houses plonked on it. Read about the threat to the golf course here.